Lupin Limited is an excellent example of how CSR (Corporate Social Responsibility) activities should be carried out to bring about the betterment of society. The multinational pharmaceutical company was founded by Dr Desh Bandu Gupta in 1968. Guided by the principle of charity and the ideology that one must give back to society in gratitude for what one has received, Dr Gupta, who is still chairman of Lupin Limited, established the Lupin Human Welfare and Research Foundation (LHWRF) in 1988. Moving on from working in 35 villages in Rajasthan, LHWRF now has an outreach in 3463 villages in 8 states of India. LHWRF’s holistic approach to rural progress encompasses economic, social, and infrastructural development. This includes agriculture, animal husbandry, and rural industries under economic development; women empowerment, education, and health under social development; and rural infrastructure and water resource development under infrastructural development. The winner of numerous awards, LHWRF has been presented with the FICCI- SEDF Corporate Social Responsibility Award (2003), the Amrita Award by the Government of Rajasthan (2010), and the B G Deshmukh, IAS Award for Excellence for Corporate Social Responsibility by the Mahratta Chamber of Commerce Industries and Agriculture (2015) among others. With the aim to extend the same service to Goa, after conducting research and surveys, the pharmaceutical company selected one of Goa’s poorest areas to be targeted as a platform to develop rural regions. Interventions were held in the following village panchayats of the Pernem taluka: Ibrampur-Hankhane Village Panchayat, Hasapur-Chandel Village Panchayat, Casarwarnem Village Panchayat, Ozarim Village Panchayat, Alorna Village Panchayat, and Dhargal Village Panchayat. The village panchayats of Nagoa and Chicalim, which are situated near the Lupin Limited plant, were also chosen, as well as NGOs that are financially in troubled waters such as Matruchaaya and Asro (Tivim). On 30th of June 2014, work kicked off at Hasapur-Chandel Village Panchayat, beginning with a focus on women empowerment. The inauguration was at the hands of local MLA Rajendra Arlekar in the presence of about 15 women’s self-help groups (SHGs). With the realisation that the majority of the SHGs in these villages had been formed by politicians or the people themselves, LHWRF looked to providing these women with adequate training, which they lacked. Initially the women were imparted training in the objectives, guidelines, and advantages of self-help groups; capacity building, accounting and book-keeping, role play of each member of a SHG, leadership, and motivation for promoting economic activity for income generation. The women from Lupin Foundation, Goa were taken to Sindhudurg, which happens to be the Foundation’s first centre in Maharashtra that was started in 2000, to experience the functioning of that area first-hand. After being equipped with plant nursery training, the SHG at Chandel village started its own nursery. Women in Chandel and Hasapur were given training in macramé and a kitchen garden kit was distributed to women of all 6 villages. The women were further trained in areas such as cooking, making masala papad, pickles, Goan savouries and sweets, paper bags, quilts, etc. Hankhane village women have received beautician training and have been taught a course in tailoring. Ibrampur has been significant in its selection to be a model village. 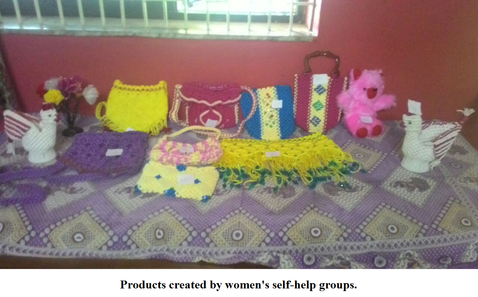 The women empowerment process has led to the formation of the NGO Sankalp (December 2015), where self-help groups are trained in the business aspects and the income generating activity. They have been loaned money by a bank to start their business. At present the Foundation is in the process of providing for a kitchen which will act as the Sankalp NGO centre and allow for the availability of FSSAI (Food Safety and Standards Authority of India) licensing to enable the sale of manufactured food products. Lupin Foundation, Goa has undertaken to fund the Sateri Vidya Mandir in Ibrampur under its Model School Development Programme. The school has been provided with science and computer laboratories, school uniforms, sports kits, roofing and chairs, separate toilets for boys and girls, drinking water facilities and an electric bell, and various events have been organised by LHWRF. Other activities at the model school are the creation of a medicinal garden which has seats and information on boards about the various medicinal plants. The school is being embellished with work done on two front windows, the provision of a stage structure, painting of the premises and the plan for a garden. Sateri Vidya Mandir has a vermicomposting unit too. Schools other than Sateri Vidya Mandir have benefitted from aid by the LHWRF. In particular, Alorna Panchakhoshi High School, Pernem; St Joseph’s High School, Nagoa; and Keshav Smruti High School, Dabolim have received science and computer laboratories. St Anne’s High school, Thormas; Lokshikshan High school, Dhargal; and St Anne’s High School, Tivim are in the process of receiving science laboratory equipment. St. Anne’s High school, Thormas; Lokshikshan High school, Dhargal; and Hutatma Bapu Gawas Memorial School, Chandel have benefited from sports kits from LHWRF. Anganwadis in Ibrampur, Chandel and Nagoa now have toys and learning aids. Cleanliness drives have been held in Sateri Vidya Mandir, Ibrampur and Govt High School, Hankhane while Sateri Vidya Mandir has profited academically from Lupin Foundation’s Science on Wheels Programme and a science exhibition camp. Inter-school Environment Day celebrations were held with 6 of the schools and special awareness programmes have been organised including one on child abuse at Hutatma Bapu Gawas Memorial School, Chandel, and another programme on eco-friendly sanitary pads at Sateri Vidya Mandir, Ibrampur. Our Lady of Succor High School, Nagoa has new Kota stone flooring thanks to Lupin Foundation, Goa. In the sphere of health, LHWRF has aided Matruchhaya's Rugnashray Physiotherapy Centre with a monthly allowance that enables 25 poor and migrant people to avail of facilities here every month. Rugnashray provides free ambulance, physiotherapy consultation and Jaipur foot fitment for the underprivileged. A malaria awareness programme has been held at the Ibrampur- Hankhane Village Panchayat and an eye check-up camp was arranged for the HIV positive children of Asro in Tivim. The solid waste management project at Ibrampur is immensely relevant in light of the growing garbage problem in Goa and to truly achieve the target of converting Ibrampur into a model village, or adarsh gram, under the Sansad Adarsh gram Yojana launched by PM Narendra Modi. The project was begun in November 2015 with the intention of collecting solid or dry waste which is not biodegradable. The items (paper, glass, plastic, etc) that can be recycled would be sold to a recycler, earning an income for the panchayat, and the rest would be collected by the Govt of Goa’s Solid Waste Management Cell. The project has four phases, of which three have already been carried out. The Sarpanch, Panchayat Secretary and other members of Ibrampur Panchayat were taken for an exposure visit to the Surla Panchayat and the garbage treatment plant in Saligao. Surla has already achieved success in solid waste management and has an area to store its solid waste. Awareness was created about segregation of wet waste and solid waste, and which dry waste can be recycled, in each ward of the village. Door to door collection of dry waste was begun, however a stumbling block was the lack of space to store this waste. A Solid Waste Collection and Segregation Centre has been proposed and is in the process of being established. 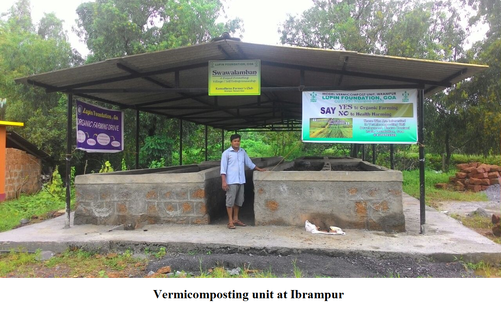 Ibrampur has benefited through other projects by LHWRF, such as an organic farming drive complemented by a model vermicomposting unit in the village and Swawalamban, a project encouraging self-dependency, was launched in April 2016. People of the village are urged to participate in traditional occupations, small scale industries, handicrafts, etc. Lupin Foundation, Goa has achieved much in terms of corporate social responsibility and is hoping to continue on this journey of alleviating the deplorable conditions of poverty. Organisations such as these make us proud to be Indians and act as an example for other institutions and powerful individuals to emulate.